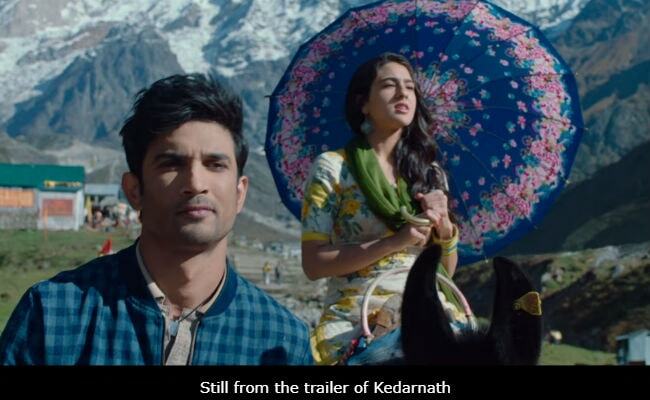 The trailer of Kedarnath is as interesting as the film's teaser, which released earlier this month. Sara Ali Khan and Sushant Singh Rajput headline the cast of the film, directed by Abhishek Kapoor. The film's plot is based on the story of Mansoor (Sushant), a Muslim porter who earns a living by helping Hindu pilgrims at Kedarnath cover a tricky trek, and Mukku (Sara), a Hindu girl who falls in love with Mansoor during her trip to Kedarnath. Mukku's family won't accept their relationship and though she's willing to fight for her love, Mansoor understands the difficult path ahead. A tragedy strikes Kedarnath shrine when it's flooded after incessant rain and cloudburst. Mansoor and Mukku's love will also be tried by nature's wrath and it seems the protagonists are all set for it. Sara Ali Khan, daughter of Saif Ali Khan and Amrita Singh, looks promising and Sushant Singh Rajput is terrific as ever. The primary filming locations of Kedarnath are en route the 14-km pilgrimage from Gauri Kund to Kedarnath. "Set against the backdrop of nature's fury,Kedarnath is not an everyday love story. Shooting on virgin and undeveloped terrain was as thrilling as it was draining," producer Pragya Yadav (wife of Abhishek Kapoor) earlier told IANS. Kedarnath is jointly produced by Abhishek Kapoor's Guy In The Sky Pictures and Ronnie Screwvala's company RSVP. It was initially coproduced by Prernaa Arora's KriArj Entertainment but the deal fell apart due to the film's financial dealing. Kedarnath will open in theatres on December 7.